What are the symptoms type 2 diabetes mellitus? Have you ever wondered what the symptoms of diabetes are? There are similarities across type 1 and type 2 diabetes, but there are also a few key differences too. People with all types of diabetes can, but not necessarily, have a shorter life expectancy. The presence of diabetes does not in itself lead to a shorter life, but rather having high blood sugar levels does. Having good control of sugar levels will cause a person with diabetes to live as full and healthy a life as anybody else. For this reason, it is important to understand and recognise any symptoms relating to diabetes. Diagnosing diabetes mellitus early can save your life in the short term but with proper management of the condition long term complications can be avoided too. Diabetes is a common condition affecting more and more people every day. In 2016, diabetes was the direct cause of death in 1.6 million people (WHO, 2018) worldwide. If we consider death from diabetes related conditions, it is estimated to lead to the death 4 million people every year around the world, more than malaria, TB, and HIV combined. b) how long you have had the condition, i.e. how long you have had high blood glucose levels for. When a person initially develops type 1 diabetes, the beta cells of the pancreas rapidly fail to produce adequate amounts of insulin. Since there is little insulin, blood glucose levels rise very quickly. The symptoms of diabetes happen rapidly, are severe, and people notice that they are unwell quite quickly. If a person develops type 1 diabetes slowly, then these symptoms may take months to develop but often it is weeks. In people with type 2 diabetes, the progression of the condition happens much more slowly, over the course of several years, so the symptoms happen slowly and are often subtle. You may not even notice anything at all, or you may even dismiss them as a normal part of growing older. By the time that you notice something isn’t quite right, you could have been experiencing high blood glucose levels for years! Often people who are diagnosed with type 2 diabetes, have had diabetes for perhaps 5 years and borderline diabetes for many years before that. What is the most common symptom in people with type 2 diabetes? That’s right. Nothing. The reason that doctors need to test for diabetes (and people need to demand it), is that most people have no idea that they have it. This regular testing is most important in people at the highest risk of developing diabetes. What are the other symptoms of diabetes? Fatigue is another common type 2 diabetes symptom. You may often feel tired, regardless of how much you have eaten, because your cells are not able to use the glucose that is broken down from the food. If you’re needing to make a lot of trips to the bathroom at night, this can also disrupt your sleep. Waking up multiple times throughout the night could mean you aren’t able to get a restful sleep, leaving you to feel tired throughout the day. This ongoing fatigue can make you easily irritable. It’s no wonder why you may be feeling more grumpy than usual! When your blood glucose levels are high, a lot of the glucose passes into the urine. Because you lose so much glucose in your urine, it also attracts water, meaning that you are making a lot of urine, causing you to need to pee a lot! If you are going to the toilet a lot and losing a lot of urine, then you are quickly becoming dehydrated. If you are dehydrated, you become thirsty. People who feel they need to constantly drink lots of water may have diabetes and it needs to be tested for. 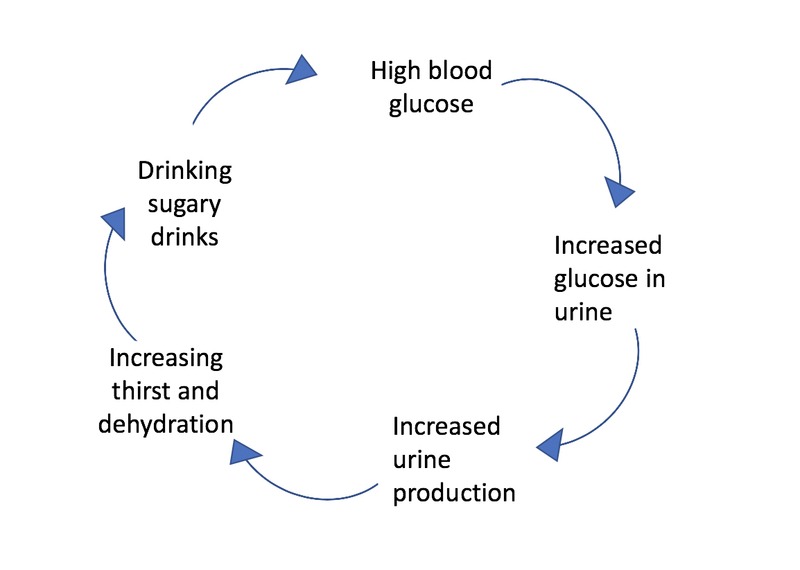 If a person with high sugar tries to deal with their thirst by drinking sugar containing fruit juice or soft drinks, then the blood sugar can become even higher, resulting in even more sugar in the urine, even more urine production, and worsening dehydration. It’s a vicious cycle. We get energy, like glucose, from the foods that we eat. People with diabetes, have little glucose entering the muscle cells, so the body will signal that it needs more food even though there is plenty in the blood. You may have ongoing hunger, regardless of how much you have already eaten, because the body is craving more energy. People with high blood sugars also have a high risk of developing bacterial infections like urinary infections, chest infections, and skin infections and boils. The cells that fight infections are called neutrophils and their function is impaired if the glucose level is above 11mmol/l (or 200mg/dl). When the body is dehydrated, our skin can become dry and feel itchy. Dry and itchy skin is more easily able to break, causing a cut or wound. Neutrophils, white blood cells that fight any infection in our body, are sensitive to high blood glucose levels. These are a very important part of the immune system and are at the front line of a person's defences, keeping bacterial infections at bay. In a person with diabetes, the ability of neutrophils to fight infections decreases, causing you to be less likely to able to fight infections, like a cut or a wound found on your foot. Pain and numbness in the feet are another sign of high glucose levels and can indicate nerve damage. You might be experiencing pins and needles in your feet, a woolly sensation in the feet or pain. In a person with diabetes, if there is numbness in their feet, they may not even realise if they have a cut or a wound. 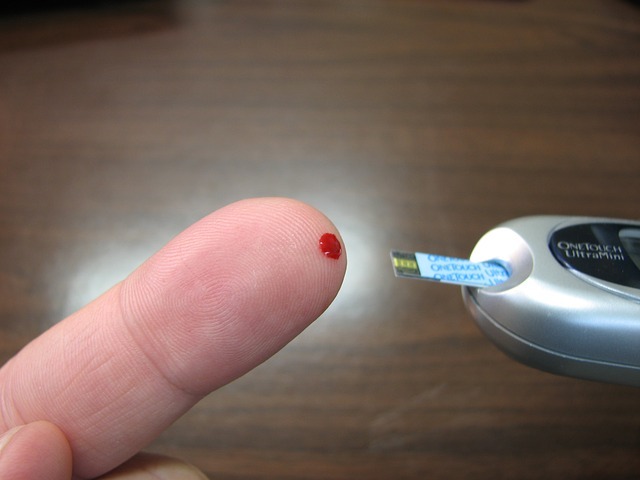 This can lead to unrecognised damage that can spread and is the leading cause of amputation in people with diabetes. This is a common complaint. Blurred vision occurs when glucose enters the lens in the eye ball. This causes it to swell, changing its shape and changing the refraction. This leads to a change in your eyesight. Some people will develop blurred and others might even notice an improvement in the eye sight! When the glucose levels fall back to more normal levels the lens changes shape again leading to a change in the visual acuity and a person’s eyesight. Many people are picked up as having diabetes by the opticians when they go for an eye check but is important to not get new glasses until the glucose levels are stable. If you have type 2 diabetes, there may come a time where you experience weight loss despite eating normally. This occurs when the glucose levels are very high and the pancreas is failing. This is a sign of severe diabetes. This results in not enough glucose being absorbed in the cells to be used for energy, so your body starts to breakdown fat and muscle instead, leading to the weight loss. Are there other conditions associated with type 2 diabetes mellitus? Type 2 diabetes is part of a group of disorders grouped together and known as the metabolic syndrome. Metabolic syndrome also includes high blood pressure, or hypertension, as well as disorders of cholesterol levels. Often people may have these conditions prior to being diagnosed with type 2 diabetes. If you experience any of the above symptoms it is important to get tested for diabetes as soon as possible. Some people are at higher risk and need regular testing if you are 45 years or older or have other risk factors for diabetes. By diagnosing and treating the condition early, it means you can decrease the risk of developing any further health complications of diabetes, for example nerve damage, blindness, and heart disease. If you have already been diagnosed with diabetes and would like to know more about how best to manage the condition, you can join our personalised 12 week diabetes program. The first week is free!